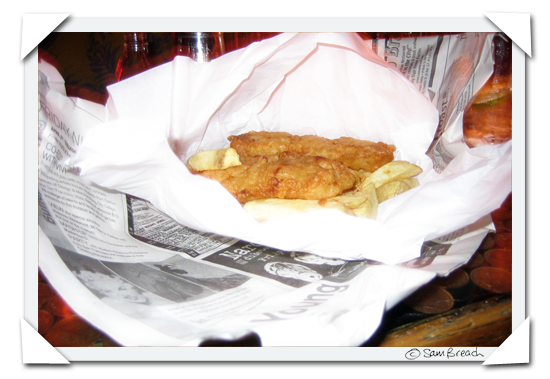 If you are hankering for some British-style fish and chips, The Edinburgh Castle at 950 Geary serves them up in newspaper every day from 5pm to 11pm. That they are wrapped on delivery gives the supper that authentic whiff of steaminess essential to the fish and chip experience. The chips are thick and taste of real potato - as they should - no crispiness expected or provided. The somewhat bland fish pieces have less character than you would find in the same meal on the other side of the Atlantic, but once doused in vinegar and dredged in salt, you can almost imagine it's the real thing. In Britain, newspaper was actually banned as a wrapping for fish and chips in the 1980s so this is a real treat. There is a good entry on Wikepedia that explains everything you need to know about this well-loved British dish. I tried fish and chips here on Friday, whilst the fish was OK it was nowhere near comparable to fish back home. You confused me with the title for a second:) I'll be having fishχps near THE Edinburgh Castle in early June - cannot wait!! Oh yay! I missed getting fish and chips while in London a couple months ago--and I have been full of regrets. I will be checking this out soon. Thanks for the heads up, Sam. In Dublin, they have great fish and chips made with lightly smoked fish. So delicious! Gtrrr. Now I want some fish and chips! And there isn't any near me! I think the English F&C are not as they used to be; with the shortage of cod, you can never be certain what you will get. Sam next time you visit we will have fish and chips! Just curious as to why they banned using newspaper to roll the fish and chips up in. Is it toxic or just a waste of paper? I love the Edinburgh Castle. They used to put on plays there that were fantistic. Great description, Sam. The whiff of steaminess, no crispness expected. That really informs me. I get it. In the late 80's when we lived in The City, I use to get F&C at Liverpool Lil's which was located just outside the main gate to the Presido. Now that I've had F&C in London I realized it is the batter that makes the difference...I think it might be baking soda? But Liverpool Lil's did have excellent bloody marys! Whenever I go to Edinburgh Castle, I always forget to order the fish and chips. Thanks for the reminder. God, I haven't been there in decades! Good chips...are you really sure they're good? You threw me for a second there as well - I thought you were visiting my city! Newspaper wrapped fish and chips is sorely missed. In Edinburgh fish and chips comes with salt and sauce instead of vinegar. Chippy sauce is a concoction of mixed vinegar and brown sauce, sounds revolting but tastes and smells amazing. I still love salt and vinegar though. Gotta have vinegar if you have fish/chips! Try Piccadilly Fish & Chips on Polk Street. It is the sister restaurant of the place that provides them for Edinburgh Castle. So Jealous!! I always have a hankering for fish and chips on Friday nights, because that's what we always did when I was a kid. Too bad there is nowhere near me to have any :( Oh, and I always have to make a chip butty too! Wow I haven't had fish and chips in years! Yummy, I love fish and chips, a weekly treat here in cardiff, UK. It tastes about a thousand times better if you eat it walking on the beach in the evening with a wooden pronged fork thing and salty air blowing through your locks, oh and some Heinz tomato sauce of course!! Although the most popular thing here is chicken curry and chips, the best of which you can buy in Dorothy's chipshop on Caroline street, near cardiff centre, great after a night of drinking!! So what fat do they use to cook the chips? And are the chips good. I so often find that the chips just aren't good! Shame about the newspaper. There was nothing like it! Hi everyone - thanks for all your comments. Of course these fish and chips did not live to my best ever memory of fish and chips but I didn't reallyy expect them too. But they did satisfy me in a way. Especially the chips. About those chips - I am not sure which oil they were fried in (I heard coconut was the best). The potato is different to england - I didn't expect fred to like them - they are nothing like french fries - but he did. i wouldn't rush there often, but certainly once in a while. Nothing like F & C - delivered in newspaper for that authentic feel. Almost like being back home I bet. Well, almost! I went to a wedding on Friday evening. It was a really lovely event and so different from any other wedding I have ever been to. The party was on Brighton pier in the south of England. And the food was fisn and chips! The tables were adorned with ketchup, vinegar, brown sauce and tartare sauce and we all had fish chips and peas followed by ice cream. It was genius, although the bride said her dress did get a little too tight after 1/2 a fish! But we danced off the excess as the sun set over the sea! If you ever find yourself in SoCal, particularly Santa Monica, you must go to Ye Olde Kings Head. The Queen order of fish and chips is great, and there is always a bottle of malt vinegar on the table. Fish and Chips - great to see so many people across the pond talking about it - it really is a timeless classic over here and hopefully it will never die out. I have a 'chippy' (as called in yorkshire' at the top of my street and come days, if the wind is right, the smell of the food carries down. Certainly makes it hard to not to pay them a visit! Great post!